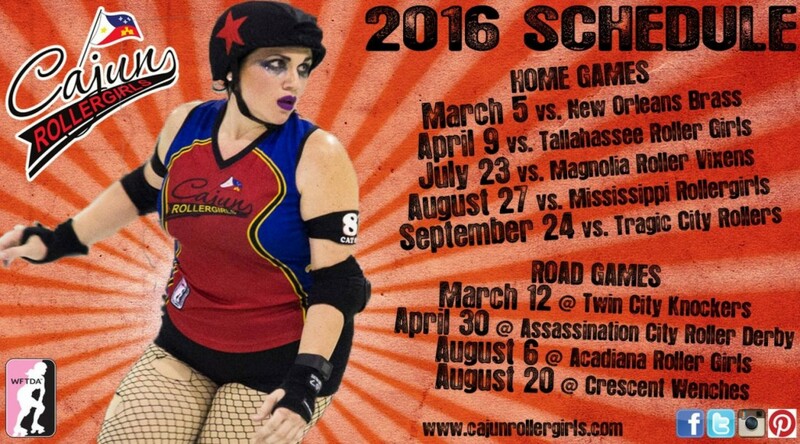 Presenting the Cajun Rollergirls’ 2016 game schedule! CRG Nation, it’s time to reveal our big news. We proudly unveil our 2016 game schedule! Think of this as an early Christmas present to you, our wonderful fans! We had so much fun opening our 2015 slate against our friends the New Orleans Brass men’s derby league last season, we’re doing it again on March 5! We also take on the Tallahassee Roller Girls, Magnolia Roller Vixens, Mississippi Rollergirls and Tragic City Rollers at Big Warren this season. For our road schedule, we travel to Shreveport to face the Twin City Knockers on March 12, then to Dallas to face Assassination City Roller Derby on April 30. On Aug. 6, we head to Youngsville to take on the Acadiana Roller Girls, and we’re in New Orleans on Aug. 20 to face the Big East Rollergirls’ Crescent Wenches! Ticket information will be available in the near future, so check back regularly. Want to join CRG? WE WANT YOU! Merry Christmas, CRG Nation!